to trade Forex like a professional. Start making profits and begin your journey to success! Start with the basics; what is the forex market, who are the key players, learn about market structure and size, what are the advantages of forex trading, and why you should trade forex. Learn how to setup a free practice account so you can try everything you learn. Learn the basic terminology used while trading forex. Get familiar with basic terms such as currency pairs, types of orders, pips, spreads, margins, and leverage. Delve into what is traded in the forex market, major currency pairs, cross currencies, and exotic pairs. Find out when the forex market is the most active and how money is made from trading. Familiarize yourself with the basic tools needed to successfully trade forex. Learn how to analyze charts, trend lines, and time-frames. Discover what trading strategies are at your disposal, such as; scalping, day trading, long vs. short trading, swing trading, and many more. Discover the factors that most commonly influence the market and what impact they can have on your trading decisions. Learn how and when to use fundamental analysis, and the importance of a good economic calendar which details upcoming economic events. Learn how to use technical analysis to evaluate the market and acquire a better understanding of the most popular trading strategies. You’ll learn about price action, support and resistance levels, chart patterns, and the importance of technical analysis. The Fibonacci Indicator is one of the most commonly used indicators. Receive an in-depth explanation of what the Fibonacci indicator is and how to use it when trading. Start creating your personal trader's toolbox. A profitable trader has many tools at his disposal. Learn about the essential tools used by traders such as; Moving Averages (MA), Relative Strength Index (RSI), Stochastic, Bollinger Bands, Parabolic SAR, ADX, and Pivot Points. The key to using forex indicators is to which to use together. Learn more about the Elliott Wave prediction pattern, divergence trading, carry trading, currency correlation strategies, and retracement/reversal strategies. Learn which indicators to use together for the best results. Trading the forex market comes with risks. Learn to manage your risk by choosing the correct leverage, proper stop loss setting, creating a trading plan, trading journal, and trading checklist. Discover how to use these risks to your advantage. Most importantly, how to choose the right forex broker, platform, and trading system. Learn about the inter-relationship between stocks, commodities, and indices to the forex market. Take your first steps and learn how to master the MetaTrader trading platform. "From the beginning the course was fantastic. I’ve done a lot of online courses before and can honestly say that I’ve never found one which was this well presented. The course was practical and the exercises were so user friendly there was no way I could fail to understand them. The course had loads of great advice in it which has really helped my trading. Since completing the course I’ve consistently made 100-200 pips a week just by following the guidelines." "Great work guys! All the material given to us like case studies and other examples were really clear and to the point. For me the best thing was how challenging the practice exercises and discussions were, they really furthered my understanding and made sure I hadn’t misunderstood anything that had been covered. After other course I've taken I’m always left a bit confused about some aspects of trading. After this course I finally understand things that have been confusing me for years! I finally feel like I’ve really learnt how to trade and have enjoyed the benefits ever since." "I really recommend this course. Even if you think you already understand the basics of forex trading, the course will introduce you to great new ideas and techniques which improved my trades. This was the clearest and easiest to understand forex course I’ve ever taken. I learned loads from the course in particular the sections on indicators and strategies." How do I get the Forex Trading Course? FX Leaders Forex trading course is FREE! Click on the chapter descriptions above and start educating yourself on how to become a Forex Trader. How will the course help me start trading Forex? The FX Leaders Trading Course will introduce you to forex trading in a clear and entertaining way, as well as familiarize you with popular trading techniques and approaches that will help you start benefiting from the market from day one. Can I take the course even if I have no Forex trading knowledge? Absolutely! 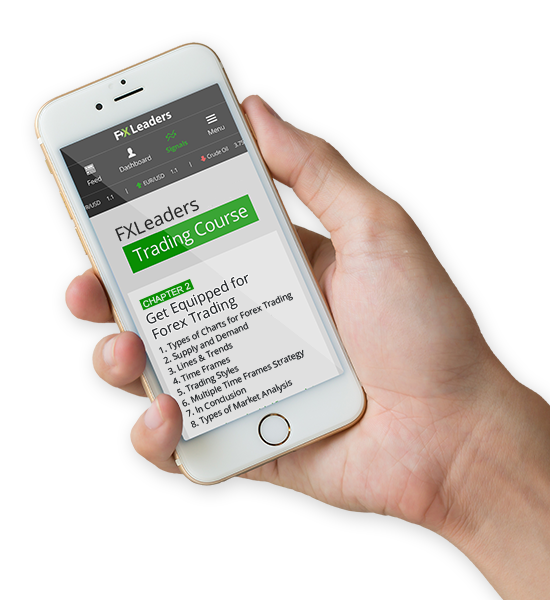 The FX Leaders course is designed to help beginners master the basics of forex trading and help build confidence to trade for real. Does the course teach about all kinds of analysis? Yes, when you take the FX Leaders course you'll learn about different analysis tools professional traders use when analyzing the market. We will dive into both technical and fundamental analysis. Market analysis can seem scary, that's why FX Leaders breaks it down into easy to follow steps.